The National Workforce Centre for Child Mental Health recognises that the best way to support infant and child mental health is through prevention and early intervention. Evidence has long supported a spectrum of mental health interventions ranging from promotion, prevention, early intervention, and treatment. 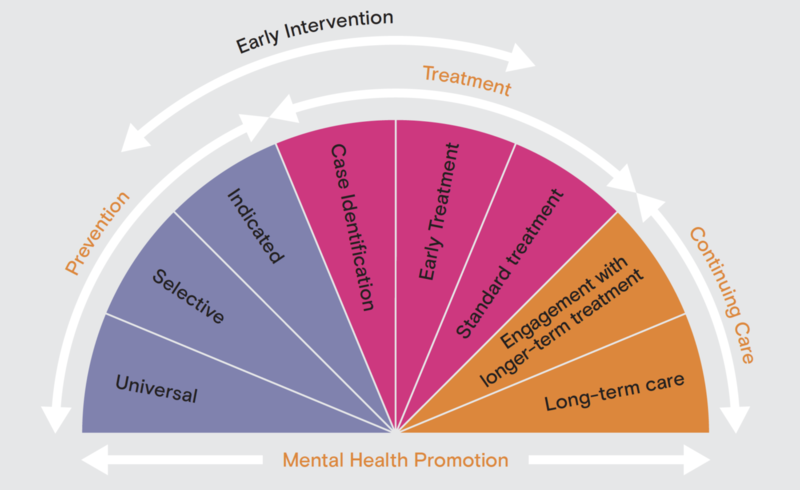 Figure 2 describes a core set of mental health services needed to decrease disorder incidence, duration, severity and premature mortality (Commonwealth Department of Health and Aged Care, 2000). A focus on preventing or intervening early in the progression of mental health difficulties not only benefits infants and children, but also creates a solid foundation for health outcomes later in life, making it a long-term investment in Australia’s future. Prevention and early intervention activities can occur early in life and/or early in the progression of a mental health difficulty. Prevention refers to interventions that occur before the initial onset of a condition to prevent its development. These types of interventions aim to identify and modify factors and environments that are associated with mental health difficulties. These factors may include perinatal influences; family and other interpersonal relationships; schools and workplaces; sports, social and cultural activities; media influences; and the physical and mental health of individuals and communities. Early intervention programs aim to prevent progression from the early signs and symptoms of a mental health condition to a diagnosable condition. These programs include interventions that are appropriate for people developing or experiencing the first episode of a mental health difficulty. Early intervention aims to reduce the impact in terms of duration and damage and foster hope for future wellbeing. Child mental health difficulties, or vulnerabilities, will often present themselves as behaviours, relationship problems, or traits. All of these presentations are indicative of strong emotions, worries or stresses in the child’s life. However, this can also result in the child’s emotional difficulties being overlooked, as her or his behaviour can be assigned labels or attributes that do not open up an exploration of underlying issues for the child. It is also important to keep in mind that these difficulties or vulnerabilities will not present in the same way as adult mental health difficulties do. Young children cannot process emotions, fears or worries in the same way as an adult. In many cases, parents or adults in a child’s life will describe worrying behaviour, or a series of behaviours, when they express concerns for the child’s emotional wellbeing. These behaviours also need to be seen in the context of child development, bearing in mind that not all children develop at the same pace. As children grow and develop, their ability to communicate or express their internal process will change. If behaviours fall outside the realm of what is expected for a particular developmental stage, they may indicate mental health difficulties. It takes a village to raise a child and in the case of prevention and early intervention the importance of the involvement of services beyond those focused on mental health is critical. These services include not only health, family and community services, but also sectors such as sports, arts, business, education, labour, justice, transport, environment and housing1. Also important are intersectoral strategies, such as those aimed at the socioeconomic empowerment of women, violence prevention and poverty reduction, as well as coordinated responses between infant, child, adolescent, adult and aged service providers and systems2. 1World Health Organization (n.d.). Mental health: strengthening our response (Fact Sheet). Retrieved from: <www.who.int/mediacentre/factsheets/fs220/en/>. 2World Health Organization (n.d.). Mental health: strengthening our response (Fact Sheet). Retrieved from: <www.who.int/mediacentre/factsheets/fs220/en/>. Image: Mrazek, P. J., & Haggerty, R. J. (1994). Reducing Risks for Mental Disorders: Frontiers for Preventive Intervention Research. Washington DC: National Academy Press.